, a learned and ingenious Frenchman, was born at Hennebon in Bretagne, in 1639 and admitted of the order of Cistercians in 1660. He made the scriptures the principal object of his study: aware of the assistance to be derived from profane history, he read with attention the ancient Greek and Latin historians. His judgment, however, did not improve with his erudition, as appeared by a new system, which he communicated to the public, in a work printed at Paris in 1687, 4to, and called “L‘Antiquite’ des temps retablie,” &c. that is, “The Antiquity of Time restored, and defended, against the Jews and modem Chronologers.” His design here is to prove, upon the authorities of the septuagint and profane history, that the world is more ancient than modern chronologers have supposed; and that, instead of 4000 years between the creation of the world and the birth of Christ, there were almost 6000. The great principle on which this | supposition is built is, that the Hebrew text has been corrupted, since the destruction of Jerusalem by the Jews, who otherwise must have been forced to acknowledge, upon their own principles, that the Messiah was actually come. Pezron’s book was extremely admired for the ingenuity and learning of it; yet created, as was natural, no small alarm among the religious. 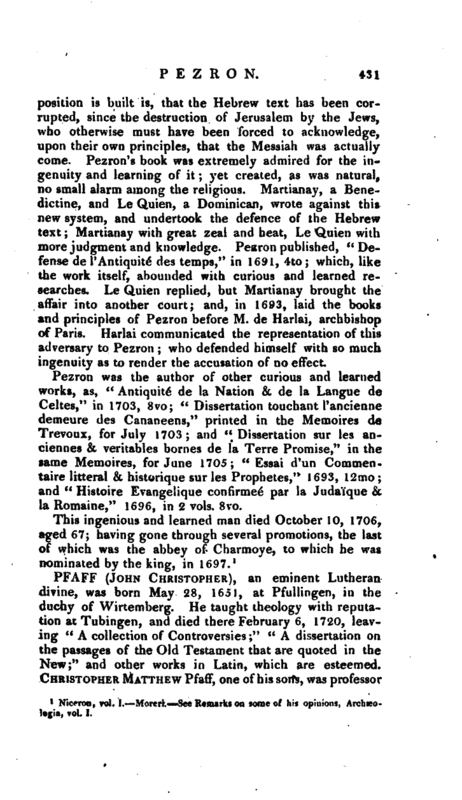 Martianay, a Benedictine, and Le Quien, a Dominican, wrote against tnis new system, and undertook the defence of the Hebrew text Martianay with great zeal and heat, Le Quien with more judgment and knowledge. Pezron published, “Defense de l’Antiquite des temps,” in 1691, 4to; which, like the work itself, abounded with curious and learned researches. Le Quien replied, but Martianay brought the affair into another court; and, in 1693, laid the books and principles of Pezron before M. de Harlai, archbishop of Paris. Harlai communicated the representation of this adversary to Pezron; who defended himself with so much ingenuity as to render the accusation of no effect. 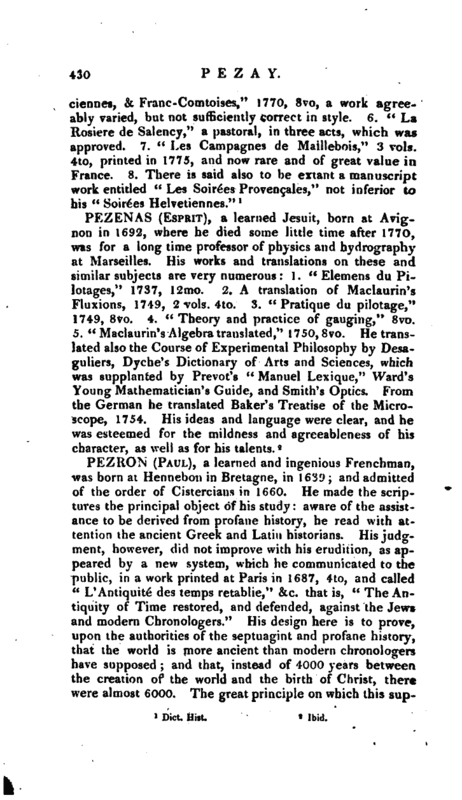 Pezron was the author of other curious and learned works, as, “Antiquité de la Nation & de la Langue de Celtes,” in 1703, 8vo; “Dissertation touchant L’ancienne demeure des Cananeens,” printed in the Memoires de Trevoux, for July 1703; and “Dissertation sur les anciennes & veritables bornes de la Terre Promise,” in the same Memoires, for June 1705; “Essai d’un Commentaire litteral & historique sur les Prophetes,” 1693, 12mo; and “Histoire Evangelique confirmée par la Judaïque & la Romaine,” 1696, in 2 vols. 8vo. 1 Niceron, vol.1, —Moreri. -See Remarks on some of his opinions, Archaeologia, vol. I.